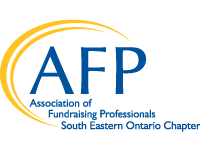 AFP SEO is hosting the Association of Fundraising Professionals CFRE Refresher Course November 5-6, 2018 in Kingston, Ontario. Included below is a description of the course, however more information is available here. The AFP CFRE Refresher Course (formerly CFRE Review Course) takes a new approach that asks participants to apply fundraising theory, skills and techniques within the six knowledge domains of the field, based on three or more years of professional experience in fundraising. This course is a combination of a high-level review, self-exploration of knowledge, and peer exchange of best practices - all of which are facilitated by a knowledgeable fundraising practitioner. Read more about our faculty. It is not presented in a lecture format. The cost to host this two day event is $390 for AFP members and $490 for AFP non-members which covers the course materials provided by the Association of Fundraising Professionals, a continental breakfast and lunch. Please note: Participation in the AFP CFRE Refresher Course may assist you in learning or reviewing concepts covered on the Certified Fundraising Executive (CFRE) examination as detailed on the Test Content Outline provided by CFRE International. However, the AFP CFRE Refresher Course is not designed specifically as a prep course for the exam. It is designed to provide a review of concepts one should know at the three-year experience level. AFP highly recommends that this refresher course be just one of the resources you use in preparing to take the CFRE exam. Your study should also include reading books that appear on the CFRE Resource Reading List.